I always thought Claudia's yarn was handwash only, but the label on this pair of skeins says it can be machine washed gentle and had a "GEMS" emblem next to it... so I guess she uses Gems Pearl as her base yarn. Lovely color, even though I've been personally shying away from high contrast, dark colorways (afraid of patterning getting lost in the color). I stumbled onto this accidentally, Stash Yarn has their Mountain Colors "display" hidden between their knitting space in the back and the cash register. 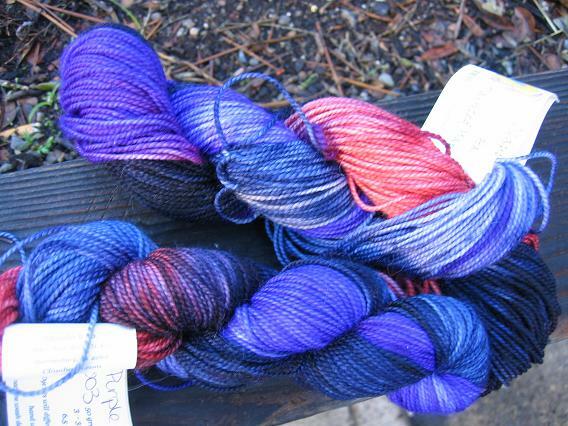 I never would have thought this was Mountain Colors; I always think of deep blue and purples when I think of their colorways. This was my first trip to Stash. I think they opened up at the beginning of the year-- they're located in the "fischu fischu" part of Solano Avenue in Berkeley, nice nice neighborhood with Zachary's Pizza, high rent and no parking. They have a large selection of yarns, although I never quite "got" how things were arranged (and I was there for a while!) -- I think its by gauge, but I can't be sure and was thrown off by the low "displays" in the middle of the room (I sat in front of these on the floor looking for Schaefer Anne colorways-- they had about 4 skeins of it and none of it grabbed me). Stash has quite a selection, lots of Rowan yarns (I saw the cashcotton 4 ply in vivid I thought I'd want for the manLace, but it wasn't tweedy like I thought it was and also a bit lighter, so I passed on it) and also lots of the fair isling yarns (the little itchyish 25gm putups... I can't remember the name!). 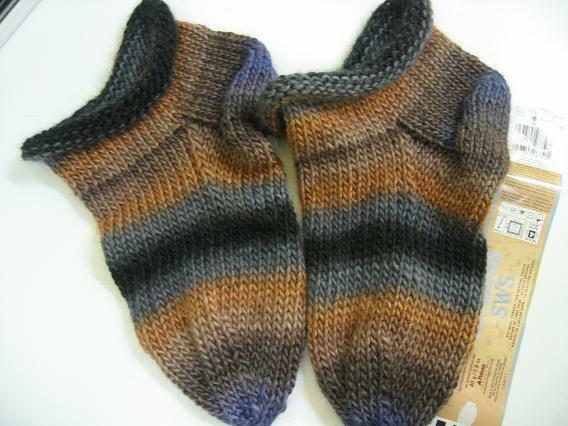 For sock yarns, they had Lorna's, Regia (silk & bamboo I remember), Nature's Palette solids (I actually really like the NP "variegated"-- theirs are never jarring or high contrast, but always really nice), Claudia's Hand Painted, Mountain Colors Bearfoot. Maybe more, I forget :) Their prices were a bit higher than the same yarns I found overlapping at Article Pract, but like I said-- this neighborhood has got to be a killer in rent, and they also have a larger space and a sitting area for knitting...) I don't live that close, at least in terms of time on transit, so I won't be back that much, but it is a nice store. I did feel a bit... clicqued out as well, like older or returning customers had the employees attention and I was a bit invisible. (Could just be the Ellison on my nightstand echoing though.) I stood at the register for several minutes waiting for a conversation between employee and customer to be finished (not ringing up purchases or finishing a transaction, and there was more than one employee there), and the employee lamented that she didn't get to say goodbye to **** and how rude she must think her while she was ringing me up (not making eye contact with me, only with the other employee). If I were "new" at this whole thing and yarn stores intimidated me like they used to, I'd also have felt irked I hadn't been acknowledged while shopping as well. But for me, old hand that I am :) the selection speaks for itself and I'm glad enough that another local store is within reach to support. I do like the Patons SWS though, don't get me wrong! The soy content has me *totally* geeking out... soy! :) Its a single, but strong as 7734-- I usually just pull yarn to break it, but I couldn't with the SWS and had to use scissors. Its soft knitting up, but when I put the unfelted slippers to the back of my neck, it felt itchy (I'm usually not a scarf girl anyway). The felting looks great... my pair went thru for one cycle in the top loader on hot and are pretty completely felted (with some nubby texture that I think looks cool) and are fuzzy... both, soy not felted? Don't know, but I like the look overall. I LOVE THAT BEARFOOT! Wacky color, for them, but I lurve it!! Pretty yarn, love the Bearfoot! and love the slippers too... 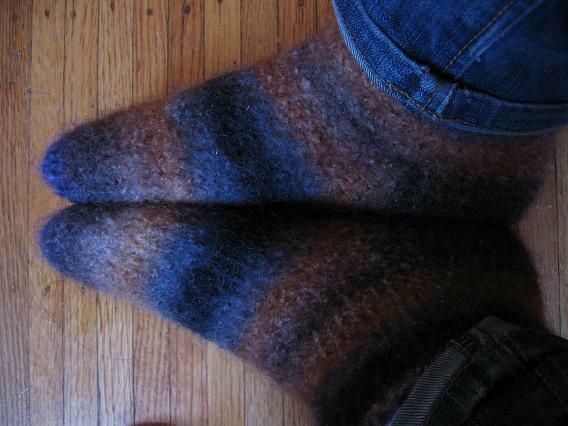 I have some of the Patons SWS that I was going to make mittens with but I might have to make some fuzzy feet instead. Oooh, I've got to try out Stash too! I'm amazed that we can have stores closing very close to new stores opening up, but it works for us as the consumer. However, Zachary's pizza? Yuck! That used to be the bribe to listen to the CEO talk at the job from Hell and I hated it. I guess I'll eat before coming East. I love the Fuzzy Feet! It's so weird how people find things different. We carry SWS, but I haven't used it yet. A cousin of mine bought some, and she couldn't use it. It broke on her every time she tried to cast on, so she got her MIL to make the scarf. I like how it felted -- have to file that in the back on the noggin. Every day I go in to work I tidy up the yarn section. We have cubby holes, too, though most of our yarn is out back. I try to make sure every color is visible and that all the colors of a particular yarn are on display, and most people will pick one and ask if we have X# of skeins. Lots of times I find wayward balls of yarn in with something totally different. Baby yarn in with the novelty Boa, Classic Wool with Decor... but this gives me something to do. Looking forward to the finished Lizard Ridge. 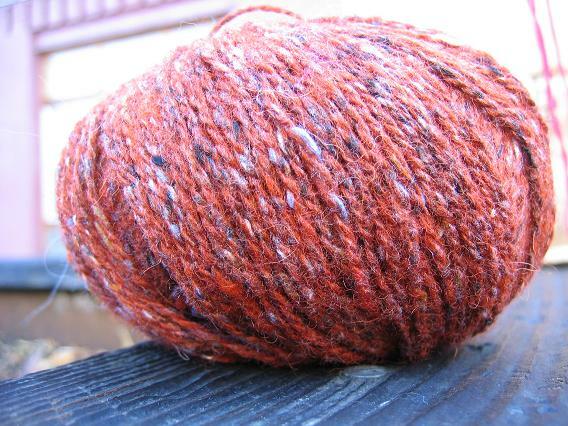 I really like that Bearfoot yarn, too. Cute stripy fuzzy feet. Must check out that yarn! Wow I love your yarn acquisitions Aija! They should inspire some serious knitting. Your slippers turned out great...look like a perfect fit! Excellent job. it's a real yarn-o-rama over here lately! hahaha! 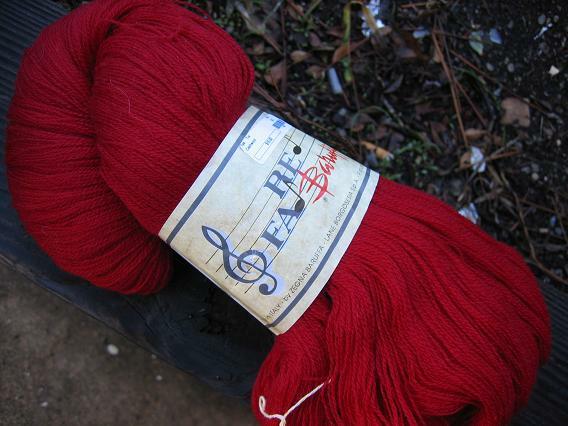 love that red lace yarn—it would make a gorgeous casino (ooh-la-la)! I certainly don't know how I would arrange a yarn store, but it's certainly not by color. I've been to a few with great selection, but by color is only good for scarf knitters, 'one of these, and one with eyelash to match' My yarn store has almost no arrangement, but that's because they've got about 3 times as much yarn as the building can really hold! Luckly the manager can almost always find what we need. And since I've taught her to make socks the selection of sock yarn has doubled! love the mountian colors barfoot and your fuzzy feet look wonderful!Can't wait to see your lizard ridge! Happy seaming! Very nice stash enhancement - I love it all. Seeing the Bearfoot made me wish I wasn't trying not to buy yarn right now! When I saw your red cashmere, I had to come out of lurkdom. Whenever I think of red shawls, I think of Susan B. Anthony. Whenever she spoke, she dressed in all black with a bright red shawl. It was kind of her signature thing. Its really amazing that over 100 years later, women are still seeking greater equality AND knitting red shawls! Congrats on getting ready to seam!!!!! Great stash enhancements! That mountain colors looks so warm and cuddly. 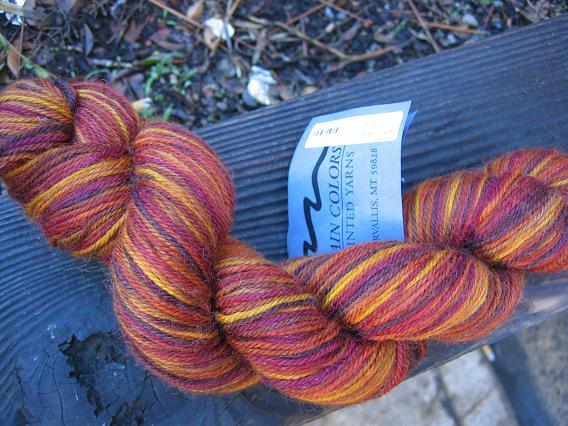 I haven't seen the SWS in person yet, but I agree, it doesn't seem to have the same organic-ness as the Noro. But the fuzzy feet look good! I can't believe you've finished the lizard ridge, I bet it looks amazing!! Ooo, the fuzzy feet look so comfy! I'm reeling from all the fibery goodness you've gotten lately too! Love love love the fuzzy feet and the new yarn! oh fuzzy feet! right in time for winter! I'm going to have to check out the SWS, I hate to say it but I'm not a fan of Noro. I like the colors, but not the yarn quailty. I wouldn't have thought that soy blend would felt! I'm totally going to try it. I can't have enough felted slippers, and I messed up my first pair of fuzzy feet, so I think it's high time to try again...thanks for the inspiration! Great virtual yarn store tour...LYSs can be so rugged to visit if you're sensitive and not part of the group. I love the fuzzy feet! I've got to make fuzzy feet. I just stumbled upon your blog through knitty and holy moly you have gorgeous work!! I went to stash last week and felt the whole "clique" thing you did as well. Didn't really care for the attitude but loved the yarn!! The fuzzy feet are so great!! I started Fuzzy Feet last night and got a few rows in before I realised I'd twisted my cast on. So I swore like a sailor, unravelled it and vowed never to knit again. Like all rational girls would. Your Fuzzy Feet turned out really cool!! Ok, maybe I'll give the SWS a try. And you had some great stash additions, didn't you? !